A ruthless competitor, Michael Jordan likely would be proud he was as close to a unanimous choice for the first class of the Hall of Fame as any athlete on the five ESPN Local sites' ballots. He was selected on 92.6 percent of the Chicago ballots, easily eclipsing Magic Johnson, who was the second most popular nominee, having been chosen on 79.4 percent of the Los Angeles ballots. Jordan walked away from his career in Chicago with a perfect and fitting ending: His last shot in a Bulls uniform won the franchise's sixth NBA title in eight years. After shaking Bryon Russell at the elbow, Jordan rose up and sank a jumper that put the Bulls ahead for good against the Jazz in the 1998 NBA Finals. Six of the eight NBA seasons between 1991 and 1998 ended with Michael Jordan clutching the Larry O'Brien trophy. Nevermind that awkward two-year comeback with the Wizards that followed, Bulls fans will forever remember the frozen pose of Jordan's last jumper that night in Utah, one of countless MJ memories. 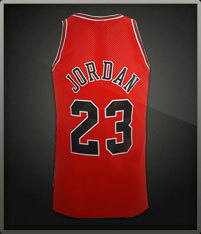 Greatness in Chicago sports begins with Michael Jordan. He won 10 NBA scoring titles, including a career-best 37.1 points a game in 1986-87. He averaged 33.4 points a game in 179 career playoff games. He won five league MVP awards and six NBA Finals MVPs. He was a 14-time All-Star and was on the NBA All-Defensive first team nine times. Jordan has the numbers to prove greatness, but he has many more moments. The scissor dribble during his 63-point outburst against Bird and the Celtics at the Boston Garden during the playoffs. "The Shot" in the 1989 playoffs on Craig Ehlo, which can only be said in your best Jim Durham voice. The perfect 50 dunk that sealed his victory over Dominique Wilkins during the slam dunk contest in 1988 at Chicago Stadium. The contorting, hand-switch layup against the Lakers in the 1991 Finals. "The Shrug," "The Flu Game," and of course, "The Shot, Part II" in Utah that in the eyes of most Bulls fans should have put the period on the end of a magical career. There are too many special moments to count, and maybe that's why Jordan's greatness only seems to grow each year.